Ok, NME, you’ve got some explaining to do and, no, it’s not about your obsession with Pete Doherty’s appetite for self-destruction this time. I bought the NME when it was New Musical Express and the emphasis used to be on new. Actually, to be completely fair, it still does new music and too much of it if you ask me. Every week there are at least twenty “great” new bands from around the world featured in “Radar”; that’s a thousand bands a year to feel guilty about not hearing, and that’s not counting the twenty “essential” new tracks featured in “On Repeat”. There is such a thing as too much music. But maybe I just slipped off-topic there for a second. This might surprise you, coming from a cantankerous old git, but what’s the deal with all the old music in the “New” Musical Express. Apart from the regular features, “Anatomy of an (old) Album”, “Soundtrack of my Life” (old songs) and “This week in …” (old news), the cover features for the last two weeks have been twentieth anniversary pieces on “The Holy Bible” and “Definitely Maybe”. I’m not saying they’re bad albums; they’re not. I parted with my hard-earned for both of them – twenty years ago. So, apart from the front cover, each of these albums gets ten pages in the magazine as well. If you delve further into the back issues, there’s a fairly predictable 100 most influential artists piece (early August) and a Led Zeppelin retrospective (late May). This is editorial content by focus group and the group must have been fifty per cent Hoxton and Dalston scenesters and fifty per cent old rockers from The Borderline and The 100 Club; sounds like a really bad sixtieth birthday party. So, what’s the target demographic (or whatever the current marketing phrase is for the people you want to buy your product) for big pieces about old music? Is it the Moss-thin, leather shrink-wrapped, pony-tailed Nick Kent wannabe who never stopped reading the New Musical Express, or is it the student who’s waded through all of the new bands and new songs and decided that there’s nothing there worth bothering with and it’s time to start looking back twenty years to find something decent. Can you imagine looking back from 1976 and thinking that you needed to find out a bit more about Pat Boone, Doris Day and Winifred Atwell? Thought not. So, where do you draw the line? How many more “classic” album anniversaries can we dig out to fill a cover and ten pages that should really be devoted to new music? And what anniversaries do we have lined up over the next few weeks; Crash Test Dummies’ “God Shuffled his Feet”? We could get ten pages out of the (not very) subtle reference to right-wing poster girl Ayn Rand’s novel, “Atlas Shrugged”, and maybe an interview with Neil Peart to pad it out. How about Echobelly’s “Everyone’s Got One”? That got them a whole season on student summer ball circuit before they imploded; should be worth a few pages, and Sonya Madan’s back out there again so she should be happy to get the publicity. Where do you draw the line? Sleeper, Menswear, Lush, Gene? I think you get the picture. NME, get a grip. If I want to act my musical age, I’ll buy Q or Mojo. Until then, I expect you to tell me about what’s happening now, not twenty years ago. Just in case anyone hadn’t realised, I’ve loved the Manics almost from day one. From the first time I heard “Slash ‘n’ Burn”, I was hooked and I’ve never heard anything since that came remotely close to unhooking me. I loved the Richey-period Manics because of Richey’s lyrics and James’s voice, playing and ability to write a memorable tune and I didn’t skip a beat when Nicky Wire took over as main lyricist for the band. He’s a gifted writer and he has an opinion or two; I like that. 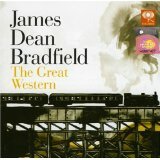 So, in 2006, when James Dean Bradfield released his solo album “The Great Western”, I couldn’t wait to get my hands on a copy. I loved it the album the first time I listened to it and I still love it every time I listen to it. The highest chart position it reached (with minimal promotion) was 22, and that puts it firmly in Closet Classic territory. Oh, and my favourite mondegreen is on this album, but I’ll tell you about that later. So why would a songwriter in a commercially successfully and critically-acclaimed band want to release a solo album? Well, the Manics have always been big on the manifesto songs but, with a few exceptions (including “Life Becoming a Landslide” and “Ocean Spray”), they’ve not really done the personal, apolitical and introspective thing. If you’re a songwriter as prolific as James, you’re always going to have a bunch of great songs that just won’t work on any band album. When you listen to “The Great Western”, you realise that it would be criminal not to get these songs out there. I love an album that opens with a big guitar riff and “The Great Western” certainly ticks that box; throw in some handclaps as well on the intro to “That’s No Way to Tell a Lie” and you’ve got my attention from the first four bars (it was even used on “Match of the Day”, so full marks to that BBC researcher). The production on the album is generally Spectoresque wall-of-sound, with the exception of the beautiful minimalist acoustic Jacques Brel cover “To See a Friend in Tears” and the final song “Which Way to Kyffin” which references Laurie Anderson’s “O Superman”, and James has great fun with all of the melodic invention, layers of acoustic and electric guitars and completely over-the-top backing vocals that you would never hear on a Manics record (ok, maybe on “Everything Must Go”). Lyrically, the album generally looks backwards to the early days of the Manics, life in the valleys in the 1980s and moving away from that life. “An English Gentleman” is a tribute to the band’s first publicist, Philip Hall, “Say Hello to The Pope” and “Bad Boys and Painkillers” (the only song on the album co-written with Nicky Wire) look back to life in Blackwood, and “Emigré” deals with the conflict created by leaving your roots to pursue your dreams. “Still a Long Way to Go” sounds a lot like a prequel to the highly personal “Ocean Spray” and “Run Romeo Run” has a chorus to rival anything that made it on to a Manics record. Anyone with a pair of ears knows that James Dean Bradfield can write a great tune (and you can ask Shirley Bassey about that) but “The Great Western” proves that he’s a gifted lyricist and a talented producer as well. Seven years after I bought this album, I still love to listen to it and I’m convinced that James had a huge amount of fun putting the whole thing together. I suspect it was bought almost exclusively by Manics fans and that’s a bit of a shame really because this is a superb bunch of songs and it’s eclectic, well-crafted, well-performed and well-produced. And what about that mondegreen? After hearing “On Saturday Morning We will Rule the World” many, many times I was still confused by a line that I heard as “A book of Brie and a telephone” until I finally realised that it was “A Ford Capri and a telephone”, which is ironic given that I’ve spent the last ten years living as an emigré a couple of miles from the old Ford complex in Dagenham. Even if you’re not a fan of the Manic Street Preachers, put your prejudices to one side and listen to an album that absolutely fizzes with emotion and musical and lyrical invention. What more could you possibly want?